Running can be boring, especially for someone who refuses to listen to music and who runs alone. One good thing is that I am always listening (for cars) and looking around and observing. Yesterday I came across this sight. I had to stop and take a picture. I didn’t know if the picture would come out or not, but it did. Look in the sky of this image. There is a dark line running across it. It is perfectly straight, goes across the whole sky and seems to even intersect the contrail from a jet. I took two pictures and then started my run again. As I got to the stop sign ahead, the line was gone. I looked up and it wasn’t there anymore. There is probably some reasonable answer as to what this is, but I was fascinated by it. 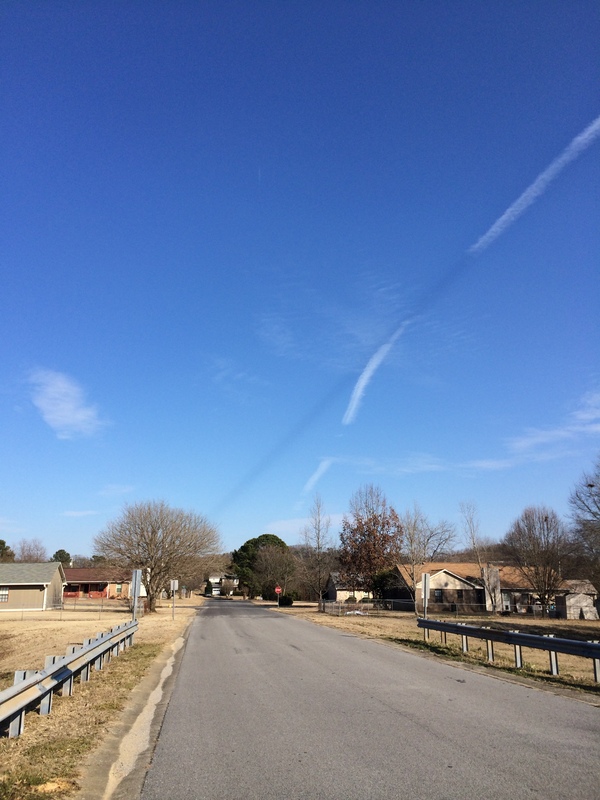 I’ve seen lots of interesting things in the sky, but never a long black straight line. Anyway, back to my boring run. I hope to one day qualify for Boston… that is no secret. So whether I want to or nor; whether it is cold or hot; if I am tired or sore… I run. I have to make my goal. Now, once I do, that will be interesting. What next… I think I have a few years to make to make that decision. Today I am taking off as I have been running for 6 days straight and my hip is beginning to rebel. Saturday morning TJ and I are going to run the Donut Dash. @BigBigGeek is unfortunately hurt and can’t do it this year. I guess I’ll get his share of the donuts! Have a great weekend and when you run… look at the sky. This entry was posted in Boston, Boston Marathon, Running and tagged Boston, Boston Marathon, running, Sky, training. Bookmark the permalink. I asked a meteorologist friend if he knew what the black line was. The only thing he could come up with is that it’s the shadow of the contrail. But he wasn’t sure. Anyway, thought I’d share! Interesting. Thanks! I do have one more picture that shoes it moved away from the contrail. It was strange. I appreciate you letting me know. I guess it will remain a mystery.